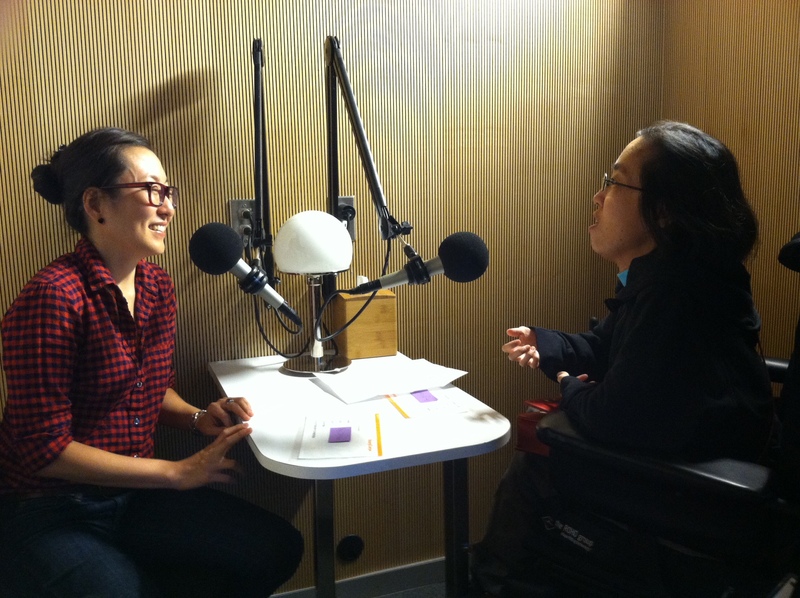 The following are some excerpts from an interview conducted by Alice Wong, Project Coordinator of the DVP, with Mia Mingus on August 23, 2014 at StoryCorps San Francisco. This is the last of three blog posts featuring Mia and Alice’s interview. Alice: I really want to read something about your blog Leaving Evidence and that’s how I came to know you through your writing and it was just really eye opening…when I first read your work, I’m like, this woman is mirroring what I’m thinking and feeling. “This passage really resonated with me. You write, “We must leave evidence, evidence that we were here, that we existed, that we survived and loved and ate. Evidence of the wholeness we never felt. An immense sense of fullness we gave to each other. Evidence of who we were, who we thought we were, who we never should have been. Evidence of each other, and there are other ways to live past survival, past isolation.” And, you know, I have to say that some of these ideas really, you know, must have given me the impetus to do this project because it is an extension of leaving evidence that people are coming together, having conversations like ours, and having this archive that we’re going to pass on to other people when we’re nothing… hopefully, when we are becoming dust particles, in the environment, then there will be lots of other clearly disabled women out there doing things. And then they can say… But what are your thoughts about leaving evidence and why you wrote that and how you came about that? Mia: I wrote that because I couldn’t find any other things and it has been a cornerstone of like my work is that like the reason why I do it is because I want to leave evidence for other people. And I want us to be recognizable to each other. I want them to know that I was searching for them even long before they were born. And that I’m, I don’t know how they have survived, but I’m happy that they’re here. And whether they’re queer disabled people of color, whether they’re queer API, whoever they are like I. All of the, whether they’re adoptees like, I, I am happy that they have made it this far in their life or what have you. And I hope that they leave evidence too because I know had other people left more evidence. I, I was like, so hungry to find it and it was so hard for me to find. I also think that like, our lives are so much more complex than anyone gives us credit for and so I don’t wanna be in this like horrible like disability pride like machine where I have to be like wearing my I heart disability sandwich board and like ringing my bell everyday, and like disability is great. I wanna talk about the hard parts of it. The days where it’s not great, and the days where I have so much pain that it’s like hard to get out of bed. And I wanna be able to talk about that without people saying like oh. You must, you must wish you were dead instead of being disabled. I want to be able to have complex conversations around what it means to be a disabled queer woman of color and be trying to have loving relationships where access intimacy exists and where I don’t have to hide parts of myself in order to receive access. And that I can have the kind of like fullness and, and loving relationship and kind of, like, queer liberatory love that we talk about in queer political theory but that doesn’t seem to incorporate, like, understanding of ableism, and, and how ableism functions and how it, like, impacts our lives so deeply. As a queer person, like, I wanna be able to talk about that as a disabled person. So, it’s, that has been such a piece of my own work, and I think also, like, I don’t, you know, the work that I do is almost, most of it has been things that, like, people don’t wanna talk about. I do a lot of work around ending child abuse and ending sexual violence, and like, in the disability community especially, we don’t talk about those things, and yet, it’s happening all the time within about that. And yet it is happening all the time. So I see it as part of everything. Mia Mingus is a writer, community educator and organizer working for disability justice and transformative justice responses to child sexual abuse. She identifies as a queer physically disabled Korean woman transracial and transnational adoptee, born in Korea, raised in the Caribbean, nurtured in the U.S. South, and now living on the west coast. She works for community, interdependency and home for all of us, not just some of us, and longs for a world where disabled children can live free of violence, with dignity and love. As her work for liberation evolves and deepens, her roots remain firmly planted in ending sexual violence. Mia is a core-member of the Bay Area Transformative Justice Collective (BATJC), a local collective working to build and support transformative justice responses to child sexual abuse that do not rely on the state (i.e. police, prisons, the criminal legal system). She believes in prison abolition and urges all activists to critically and creatively think beyond the non-profit industrial complex. Her work on disability justice has been cited and used in numerous texts and events around the world. Mia was recognized by the White House as a Champion of Change, an honor bestowed on Americans doing exemplary things to uplift their communities. Along with 14 other women, Mia was recognized as an Asian and Pacific Islander women’s Champion of Change in observance of Asian and Pacific Islander Heritage Month. Mia was a 2005 New Voices Fellow, was named one of the Advocate’s 40 Under 40 in 2010, one of the 30 Most Influential Asian Americans Under 30 in 2009 by Angry Asian Man, one of Campus Pride’s Top 25 LGBT Favorite speakers for their 2009, 2010 and 2011 HOT LISTs, and was listed in Go Magazine’s 2013 100 Women We Love. Mia was honored with the 2008 Creating Change Award (below) by the National Gay and Lesbian Task Force and a community activist award for her “dedication and steadfast activism” in 2007 by ZAMI in Atlanta, GA.
Alice Wong, is a Staff Research Associate, Department of Social and Behavioral Sciences, UCSF. Alice works on various research projects for the Community Living Policy Center, a Rehabilitation Research and Training Center funded by the National Institute on Disability and Rehabilitation Research and the Administration for Community Living. She is an author of online curricula for home care providers and caregivers for Elsevier’s College of Personal Assistance and Caregiving. Currently, she is the Project Coordinator for the Disability Visibility Project: A Community Partnership with StoryCorps and an advisory board member of APIDC, Asians and Pacific Islanders with Disabilities of California. Alice is also a Presidential appointee to the National Council on Disability, an independent federal agency charged with advising the President, Congress, and other federal agencies on disability policy.